Licensing for radon testing has arrived in Minnesota, and with that comes a lot of red tape. A lot of these changes are boring behind-the-scenes reporting and documentation changes that only matter to radon testers. Other changes, however, will be quite visible to anyone having their home tested, and will surely raise a lot of questions. Today, I’ll try to address those questions that I know will start coming. Disclaimer: I am not personally licensed, but I have several licensed radon technicians on my team who are, and I’m ultimately responsible for making sure that they follow the radon licensing rules, so I’ve invested a lot of my time into making sure that my team fully understands and complies with these new rules. The information that I’m sharing has been reviewed for accuracy by Dan Hylland at the Minnesota Department of Health (MDH). The most obvious change to radon testing in Minnesota will be the requirement for duplicate tests for any test device, including anyone using electronic radon monitors, more technically referred to as Continuous Radon Monitors, or CRMs. For every 10th test conducted, a second CRM must be placed right next to it to help ensure accurate testing. To be specific, the second monitor must be placed 4” – 8” away from the first monitor. Both of the test results must be read and reported to the client, and the results of those two tests must be averaged for the official reading. The test results from two side-by-side radon monitors will probably not be identical; one monitor might read 3.9 pCi/L while the other reads 4.3 pCi/L. Variations like this are perfectly normal and are even expected. The final number reported will be the average of these two, which is 4.1 pCi/L. The only time that variations in these numbers create a problem is when the numbers vary too much. For tests above 4.0, the maximum allowable relative percentage difference (RPD) is <36%. This is calculated by taking the difference between the two tests and dividing by the average. For my example above, the difference between the two tests would be 0.4 (4.3 minus 3.9). Divide that by the average of 4.1, and you have 9.8%. Again, this difference is normal, as most duplicates are expected to have an RPD of 0-14%. In short, 10% of the tests that are conducted, including those done with CRMs, will require duplicate testing. Both of these reports must be given to the client and averaged for the official number. One radon monitor must be placed for each foundation type. 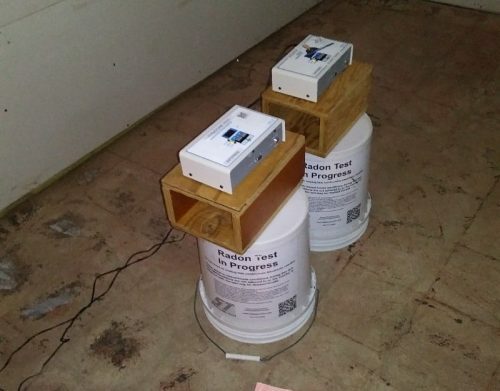 If a home has a traditional basement, a crawlspace, and a slab-on-grade addition that is part of the home, that home will need to have three radon monitors placed, and three test results are given to our client. One for the basement, a second in the finished space above the crawl space, and a third for the slab-on-grade room. As we say here in Minnesota, uff-da. This change won’t affect most homes, but for homes that have had additions and remodels, it may very well mean several tests being placed at the same time. Will these additional tests affect the price? It’s up to the company or individual to decide. I’ve found that the people who hire us to perform radon tests are largely unaware of how many foundation types are present in homes, so I think it will be next to impossible to figure out this information ahead of time. I hate hidden fees, so for us here at Structure Tech, my hope is that we’ll be able to simply absorb the cost of these additional tests without any upcharges for additional tests, but only time will tell. I’d like to give a big shout-out to my lead radon technician, John Fitzgerald (aka Radon John) for all of his hard work communicating with the folks who are in charge at the MDH. He has put in a lot of long hours trying to make sure that we have all of this information exactly correct. Also, a big thank you to Dan Hylland at the MDH for reviewing this blog post and spending a lot of time on the phone with us and trading emails with us to help make sure that we’re doing things right. I appreciate all of your help, you two. The Heartland Chapter of ASHI will be having Josh Kerber and Dan Hylland from the Minnesota Department of Health come out to present at our monthly chapter meeting on 2/11/19, at 6:30 pm at Frankie's Pizza in New Hope. All home inspectors, radon professionals, and support staff are welcome to attend this meeting, but seating is limited. To register for this meeting, please visit http://ashiheartland.org/register/.